The Fiesta Bombarda are responsible for some of HiFi’s most chaotic nights of the past year. Not in an organisational sense (they are one of the most reliable and organised promoters in the game), but in terms of the chaos that ensues on the dance floor. Combining the spectacle of live music events with the no-nonsense attitude of a club night, their events habitually move audiences in all parts of the country. Recently, they have hosted Gentleman’s Dub Club and Hypnotic Brass Ensemble with us, but their next event is set to be even more special, as it is happening on New Year’s Day with party-starting folk singer Beans on Toast. We spoke to Sam from Fiesta Bombarda to find out more. Tell us a bit about yourselves. What does Fiesta Bombarda do? Fiesta Bombarda is a vibrant event that travels across the UK, taking some of the world’s best Afrobeat, Brass and Reggae bands to the best venues and most unique spaces we can think of. Whether it’s a Cathedral carnival or Palm House party, we aim to blur the line between the live music and club scene by combining bands, set design, visuals, interactive stalls and an all-round festival-esque experience. Who says you can’t dance to a 10-piece brass band at 2am! What were your first few events like, and what did you aim to do with them? Fiesta Bombarda was only ever intended to be a one-off carnival in Liverpool’s Bombed Out Church back in 2012 to celebrate our graduation, however due to the huge and unexpected success we knew we couldn’t end it there, since then we’ve been lucky enough to naturally evolve the whole concept year by year. After hosting a few great parties across the city during our inaugural year, the first milestone we struck was hosting events in the iconic Liverpool Cathedral and St. George’s Hall. From there we knew we couldn’t just stick to our hometown as we ran out of unique spaces to host these carnivals, so we began to take Fiesta on the road. We’re now lucky enough to have hosted events in 12 cities across the UK and our next step is to bring the Bombarda experience to more festivals in 2017! What events or festivals inspired you to do what you do? How have you tried to emulate or differ from others? 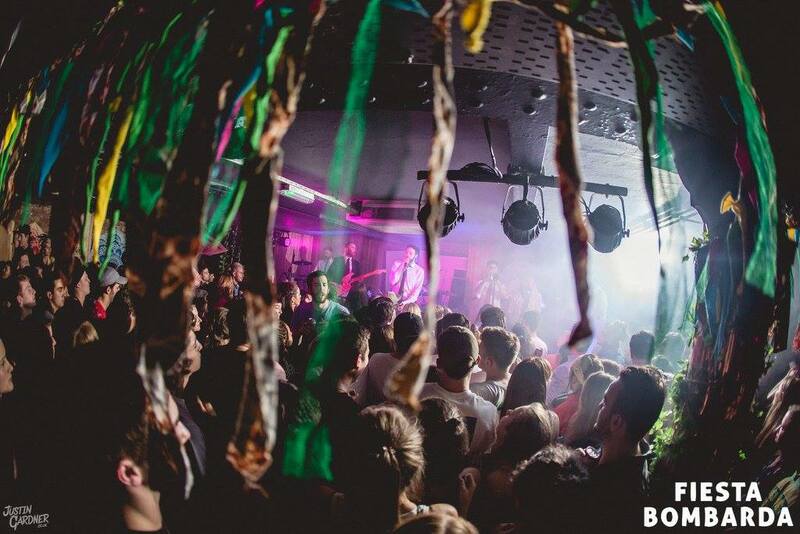 What we quickly learnt when we began taking Fiesta on tour was that there was a clear distinction between live music events and club nights in most cities, so we saw that our niche was blurring the boundaries between gig and club night; live bands and raves. In terms of inspiration it’s been such a natural evolution that we’ve never really had a chance to contemplate and take influence from others, but what the likes of Farr Festival, Boomtown, Gottwood, Soundwave and Obonjan are doing is amazing, all of which champion the experience as much as the line ups. What is it about the festival atmosphere that you love the most? Although music is an integral and amazing part of festivals, it’s still only one part – the social and communal aspects are always the best aspect for me. Meeting likeminded people, experiencing the installations or set design and being a part of something that is so envisioned and meticulously planned. The variety of acts at your events is something to behold – what is the common theme between your bookings? We’re not too elitist with the genres that we host; as long as it fits in with the carnival-atmosphere that we purvey then we’re happy to include it. We’ve had afro-beat collectives and dub-reggae legends on the same bill before and it seems like our audiences appreciate the variation. Your events span the length of the country. Why did you choose to do things this way? Is it hard to manage? Managing can be hard as we’ve expanded at such a rapid rate, but Fiesta has never just been about one person, it’s about the entire collective all pulling together to make our carnivals happen. Whether it’s the DJ putting up set design or stage manager being in one of the bands, the whole team is incredibly dedicated and makes Fiesta what it is today! What have been your most memorable moments while running the events? 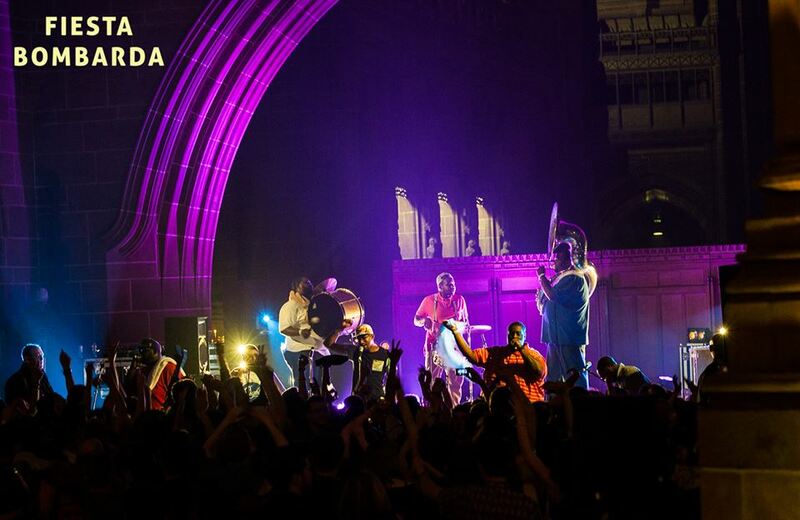 Hands down our 2nd birthday Cathedral carnival with Hot 8 Brass Band. My Mum still talks about that all the time two years on.Tell us about the New Year’s Day event you have planned with us. New Year’s Day is the new NYE – this will be our first party around New Years and we couldn’t be more exciting. For everyone that’s sick of the expectation and drama that consumes NYE, this is the night for you. It’ll be all about dancing to live music, until the early hours, listening to Beans on Toast drunkenly sing his heart out, a huge selection of local funk and soul bands/DJs and all of our usual carnival shenanigans; Fiesta face paints, tropical decor and our crazy stage manager Laura buzzing around the venue like a hamster on Red Bull. Make sure to upgrade to first class when typing out answers on the train.